At AdvantaClean, we want our friends and neighbors in Salinas, CA, to know the value of crawl space encapsulation. When it's especially humid outside, your crawl space may be in danger of harboring mold and mildew. There are various ways to prevent this, as you'll see below. 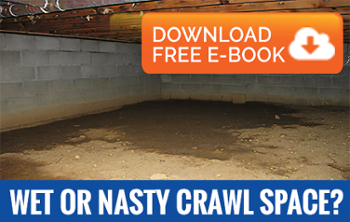 Crawl spaces remain humid year-round. At the same time, moisture can develop on your walls and drainpipes as well as from the soil via a process known as vapor drive. Combine this moisture with humidity levels of 70% or more and the presence of organic matter like wood, and you'll soon have mold and mildew inside. By feeding on that organic matter, these fungi will create dry rot, weakening the structure. Warm air rises, so the air quality of your crawl space will naturally affect the air quality in the rest of your property. Continual mold exposure is especially bad for children and for allergy and asthma sufferers; symptoms can range from headaches, coughing, and chronic fatigue to respiratory problems and even memory loss. Crawl space vents are usually a bad idea in humid climates, as they can actually increase the amount of humidity. They may also let in rain during periods of heavy rainfall. That's why if we install a crawl space vapor barrier, we'll most likely seal off any vents. Crawl space encapsulation involves the installation of a thick plastic membrane called a vapor barrier. It will go over the walls and dirt floor, and it can be reinforced with fiberglass. A drainage system may need to be put in place behind the barrier; this will drain away any condensation that develops. As mentioned above, the barrier will cover up any crawl space vents. You can even request foam insulation, which can transform the area into a viable storage space. A crawl space dehumidifier may be a good alternative to encapsulation, though keep in mind that it will present a continual cost. We'll set the dehumidifier so that it comes on before humidity reaches an unsafe level. AdvantaClean has more than 20 years of experience installing crawl space dehumidifiers and vapor barriers. It has become such a renowned brand that in 2016, it won the Best of HomeAdvisor Award; it's still considered a HomeAdvisor Elite Service Professional and a Thumbtack Top Pro. Our local branch will live up to this high reputation, so call our office in Salinas, CA, to ask any questions about crawl space encapsulation.